A CHRISTIAN woman was stabbed by an asylum seeker after he heard her reading from the bible. The 50-year-old woman was only saved by her winter coat when she was attacked with a knife in the accommodation in Timelkam in Voecklamarkt in Upper Austria. 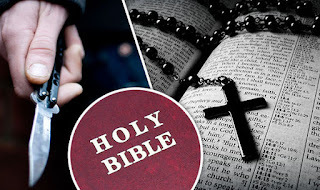 Her alleged attacker is a 22-year-old man from Afghanistan who had taken offence to the fact that the woman had been invited by Christian residents of the property to discuss the bible. Luckily her thick winter coat protected her from serious injury, but she did injure her ear when she fell backwards from the force of the man's violent blows. When questioned by police, the man accepted he had overreacted but claimed he was suffering from 'personal problems'. He was ordered remanded in custody and taken to Wels Prison in Upper Austria. It is unclear if he has been charged yet. The horror attack happened just days after a teenager was battered by a group of migrant men in the Austrian capital of Vienna. And on Christmas day the migrant crisis issue was addressed by the Archbishop of Vienna when he said Austria could not cope with the huge numbers arriving.